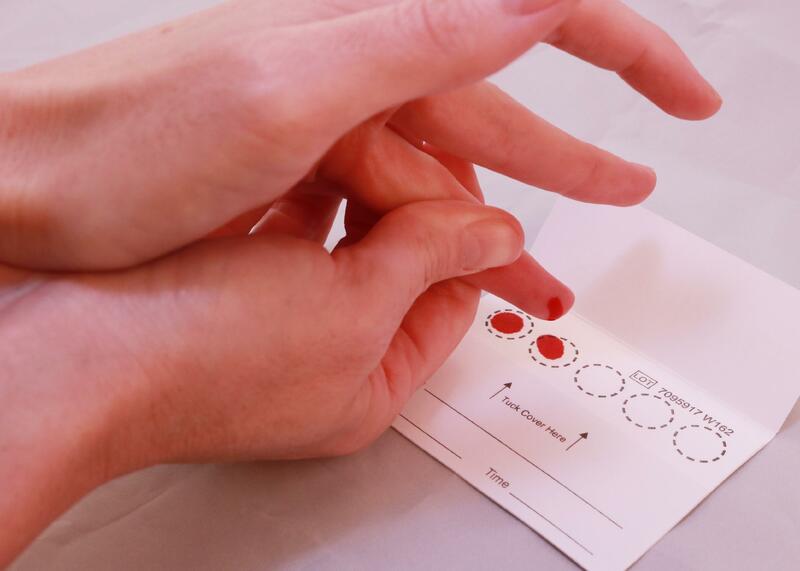 Collecting a blood sample for your EverlyWell test kit is simple. 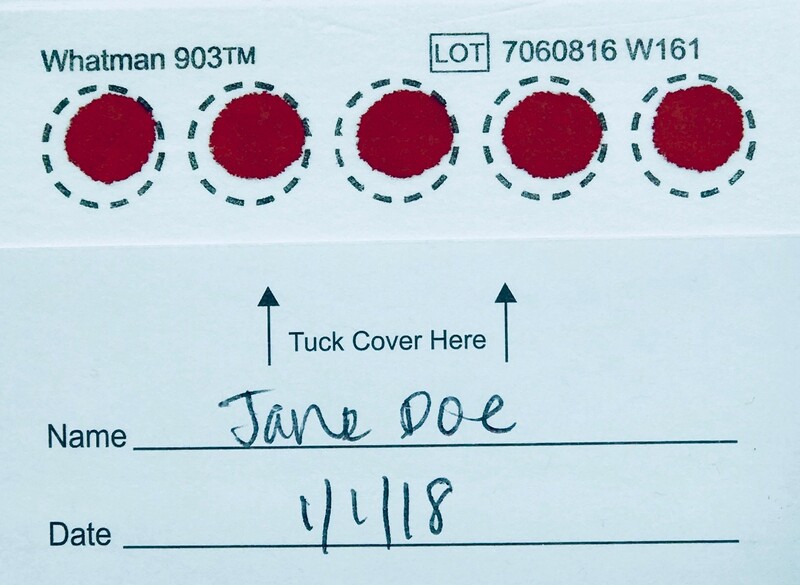 Blood collection instructions vary by test, so please make sure to follow the appropriate instructions for any tests you are taking that require blood spot samples. Step 1: Select ring or pinkie ﬁngertip and clean the desired puncture site using the alcohol prep pad. 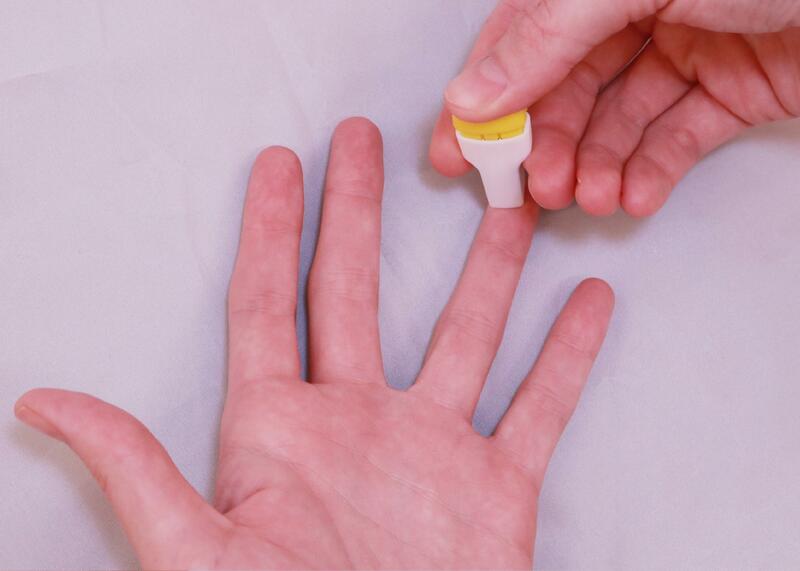 The best site for a finger puncture is just off the center of the finger pad. Step 2: Fold collection card open on a ﬂat surface. Remove and discard the plastic safety end on the lancet by twisting and pulling it. Step 3: Please note that the lancet will only activate and puncture once. Place your ﬁnger against a ﬁrm surface. To activate the lancet, press down until an audible click is heard. Step 4: Squeeze your finger in a milking motion, moving from the base of your finger toward the fingertip to draw blood towards puncture site. Allow a single, large blood drop to fall in each circle. Ensure all circles on the collection card are ﬁlled. Complete the entire collection process on the same day. Leave the card out for 30 minutes or until completely dry. Apply a bandaid to your ﬁnger when ﬁnished. Write your name and the collection date on the card. If you do not include this information on your sample, it may be rejected by the lab. Do not rub or smear (allow full drops to form and gently fall onto the paper). Do not allow multiple drops in the same circle (no overlapping). Do not use heat to assist drying. Put your sample inside the biohazard bag and place it back into the box. You may leave the silica gel packet in the biohazard bag. Finally, send the box back in the return envelope using the shipping label provided (located at the bottom of the box). Send back your sample using the shipping carrier listed on your return label. I'm having trouble drawing blood from my finger. What should I do?